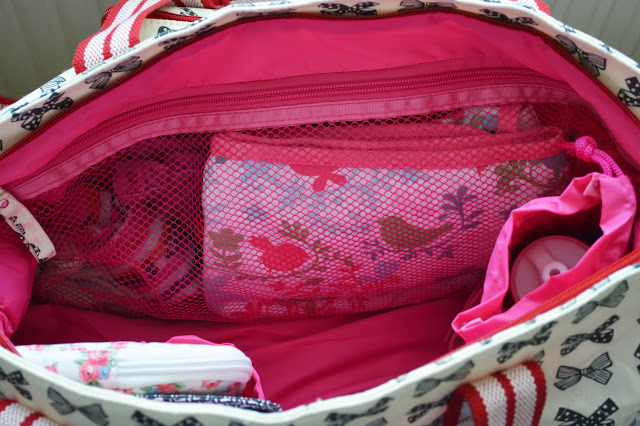 Pink Lining have recently launched the amazing Sq-washable bags which in my opinion are genius! A light weight heavy duty bag which folds away easily without any fuss and can be machine washed. 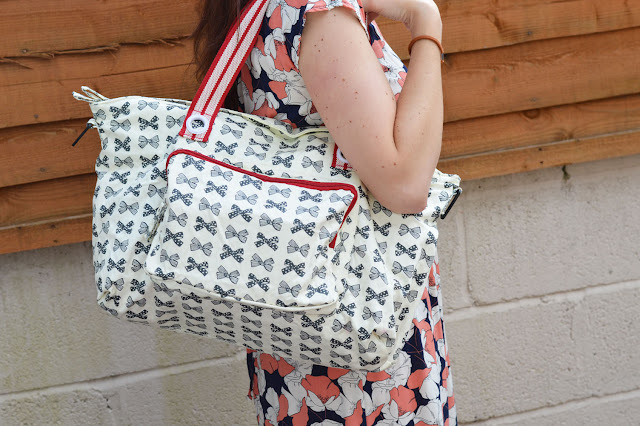 Hooray I hear all you mummies say, this for me is the ultimate mummy 'summer-time' bag. I do have high hopes for the Sq-Washable Shopper but Shhhh I don't want to give it false hope. What with our unpredictable British weather, but rest assured the shopper will be taken to the beach to fulfil it's shopper bag destiny! The Shopper is the perfect size for day trips and every day use, a very versatile bag suitable solely for yourself or for baby/child. My children are 5yrs and 2yrs, I've just got out of the changing bag era so to speak, so now I can enjoy 'adult' bags. Having made that statement I still have a toddler in tow and that brings it's requirements. 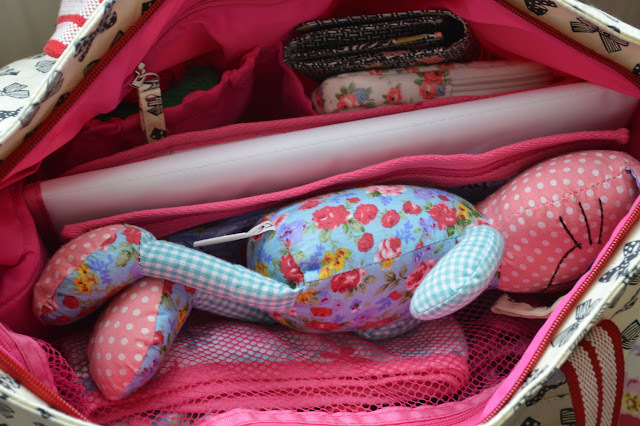 I always need spare clothes, wipes, drinks, snacks, distraction toys and not forgetting my toys! The Grey Bow Shopper has a generous front zipped pocket, lined with the popular complimentary pink lining. 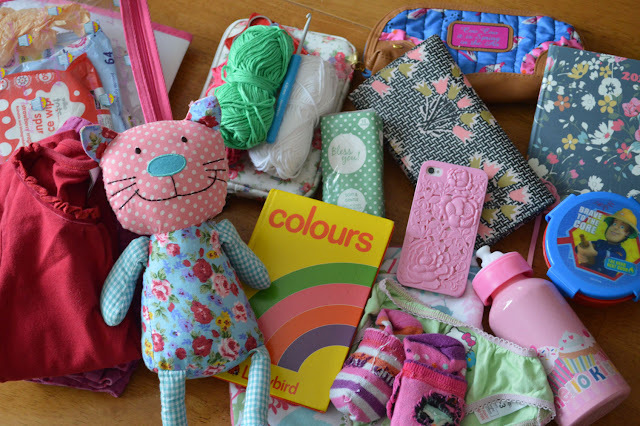 Inside are various pockets for a mobile phone, a purse or other personal items. There's a key fob which is super handy and a compact mirror. Due to the size you could easily store a diary or small book in the front pocket. The main size of the bag is very generous and the bag itself is very giving. Even though I no longer require a changing mat I still added this inside so you could see how much this bag allows. The Shopper comes with a padded changing mat and wet bag, the wet bag is a god send. Perfect for carrying wet wipes and even more perfect for times when your toddler has a toilet accident. 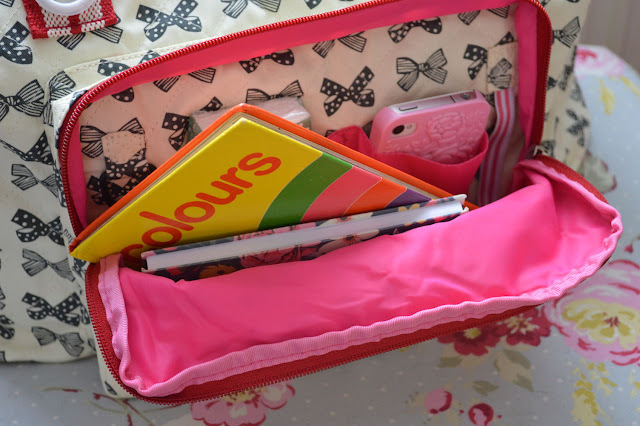 Inside there are two large pockets suitable for carrying nappies and wet wipes amongst other baby related items. I don't need to carry nappies with me during the day so I have put these pockets to good use, for myself! One pocket houses my wallet and kindle, I find these are both safer within the main zipped compartment. The second pocket houses my crochet, if you know me or follow my blog you will know I am a keen crocheter. If you want to read more about my crochet antics you can read my blog post here. Rather than this bag being a changing bag or a shopper I see it as a 'changable bag'. One day it may be used for myself only, the next it could be used for work or solely for my children. It's an adaptable bag which I think is a necessity for a working mother. 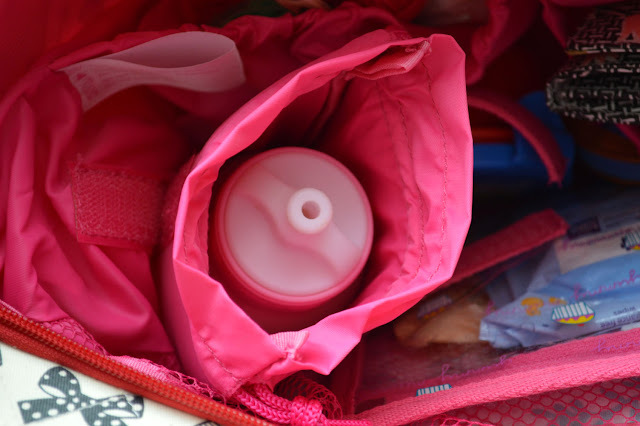 The bag also comes with a removable insulated bottle holder, perfect for bottles or holding toddlers drinks. One of the main aspects of the bag which I love is the zipped mesh compartment. Perfect for holding mummies items if you're using this bag as a changing bag OR if like me you have a toddler and carry spare clothes this is perfect for that. I have a spare change of clothes and a thin cotton blanket folded up and there's still room for more items. The mesh compartment is very roomy. 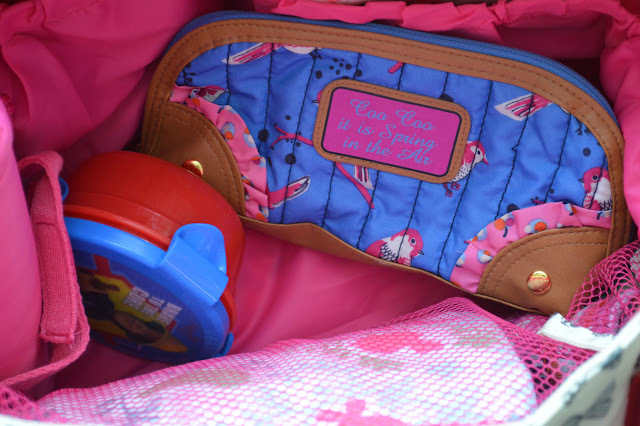 Of course there's room for mummies makeup-bag & snacks! The outer design of the shopper is super sweet, pretty grey bows with chunky durable red striped handles. 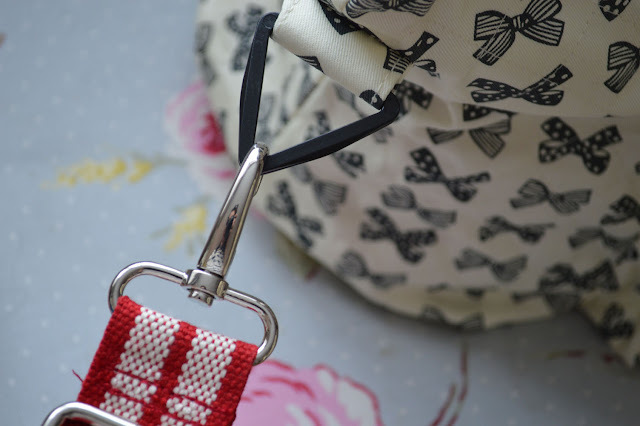 The shopper also comes with an adjustable strap which connects easily to either side of the bag, perfect for mummies who use a pram/buggy and want to carry the bag over the handles. Overall I am thoroughly impressed with the Sq-washable Grey Bows Shopper, the grey bow print is charming. The quality of bag is high, whilst the inside is something which I would like to think resembles Mary Poppins' bag. A place for everything! This for sure is MY Mary Poppins bag, could it be yours?